Studying one of the sciences, but not quite sure what you can “do” with that after graduation? 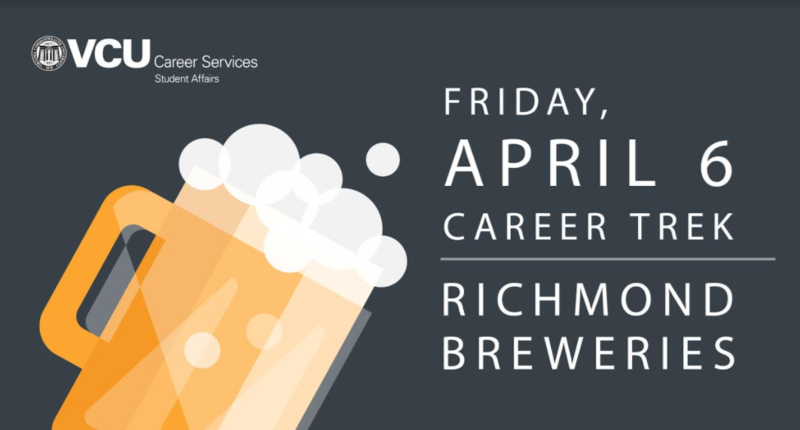 Join VCU Career Services on a Career Trek to explore the Science of Brewing! Craft brewing (and brewing in general) is at its core both an art and a science. During this Career Trek, we’re going to tour two RVA craft breweries and have in-depth discussions with their Head/Master Brewers about the science aspects of the industry. You will learn knowledge and skills needed to tap into the industry. 2:45 PM – Arrive at Three Notch’d Brewing for tour and talk with head brewer, Stefan. – Due to the nature of this event we are only able to have 20 participants, and transportation is limited to 10 participants. There is a $5 registration fee to participate in this event (refundable only if you provide 48 hours notice of cancellation). – Although no alcohol will be consumed/provided, and participants are prohibited from purchasing alcohol during this event, all participants must be at least 21 years of age. *All registrants must indicate if they will be riding in the van, or providing their own transportation to the event. Please select the appropriate option under “Item Fee” to indicate this.Registration link here: https://goo.gl/8WQdiiAdditional questions? Please reach out to us at hirevcurams@vcu.edu. A 12-month Research Assistant position is available to assist in studies of the toxic dinoflagellate responsible for ciguatera fish poisoning. The position is primarily laboratory-based and will include isolating and culturing algae, and basic molecular biology work such as PCR. Other studies are possible, depending on background. The position is open without preference to B.S. and M.S. degree holders, salary will be commensurate with experience. Prior work in either algal culture or molecular biology is strongly preferred, experience with both is a definite plus. The position is in the Erdner laboratory at the University of Texas Marine Science Institute in Port Aransas, TX (http://sites.utexas.edu/erdnerlab/). Questions about the position should be directed to derdner@utexas.edu. To apply for this position, please visit http://unc.peopleadmin.com/postings/137278 and be prepared to provide a one-page cover letter, a resume, and contact information for two people who can serve as references. Approximate End Date: Early August 2018. Hours per week may vary due to field conditions or project needs. Position is funded for approximately 11 weeks at 20 hours per week. 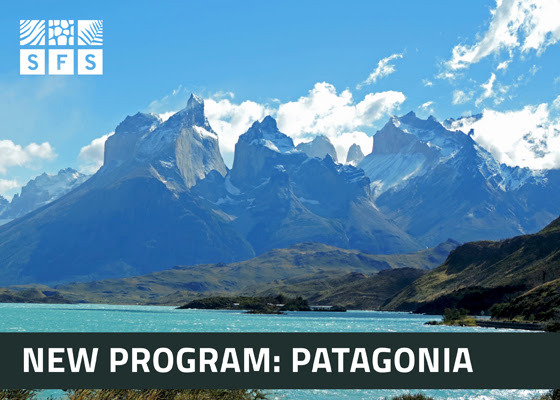 SFS is excited to announce the launch of a new program in Patagonia for Fall 2019! 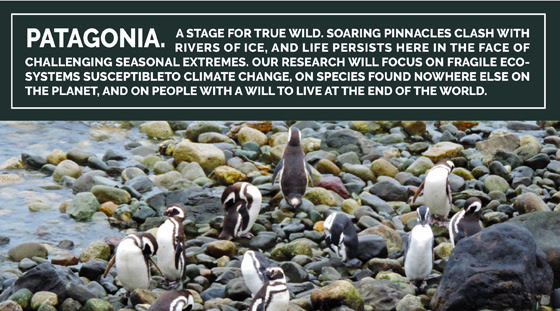 The SFS Center for Climate Studies will be based in the iconic Patagonia region of southern Chile and will offer a Coastal Climate Change in Patagonia program during the fall and spring semesters. SFS students will take field excursions to some of the world’s most massive glaciers, visit the renowned Torres del Paine National Park, explore the rich biodiversity of the Straight of Magellan and fjords, glimpse the gaucho and baqueano way of life, as well as visit neighboring Argentina. There is no shortage of stunning landscapes and environmental challenges to examine in this one of a kind region. This program will follow the SFS model offering 4 core courses plus the Directed Research course, totaling 18 credit hours. SFS will begin accepting applications for this program this coming fall. More information about this new program will be added to the SFS website this summer. Stay tuned! The National Scholarship Office (NSO) will be holding two general information sessions on Friday, March 23, at 3p, and Tuesday, March 27, at 2p.Both sessions will be held in the Multipurpose Room (1303) at the Honors College (701 W. Grace Street). These general information sessions are designed for first- and second-year undergraduates and any students who are new to VCU. A variety of national and international scholarship opportunities will be discussed. Strategies for creating a competitive profile and application will also be covered in these sessions. Bring a friend(s). Students who are not able to attend either session are welcome to schedule an appointment to meet with Dr. Meredith Sisson or Mr. Jeff Wing in the NSO. There is a link to schedule appointments on the NSO website. Thanks for helping to publicize these information sessions to your students. The VCU Rice Rivers Center (ricerivers.vcu.edu) offers the following funding opportunities for the 2018-2019 academic year. Student Research Scholarships: Competitive awards of $600 (undergraduate), $1,200 (masters) and $1,500 (doctoral) are available for field projects conducted at the Center and environs. Priority is given to projects that will advance our understanding of riverine ecosystems inclusive of their aquatic and terrestrial components. Collaborative (joint) proposals are welcomed, may request up to $2,000, and should clearly define individual roles and contributions to the overall project. Prior Scholarship recipients may apply for travel awards (up to $500) to present their findings at a national or regional meeting. period of the Fellowship (mid-May thru mid-August) and there may be other requirements, which will be outlined in the award letter. Applicants may also submit to the Student Research Scholarship program (see above) as a separate proposal. of support from a faculty mentor, and c) 3-4 page proposal that includes project title, brief introduction, objectives/hypothesis, methods, expected results, schedule of activities, and a detailed budget. The budget may include funds for equipment, supplies, laboratory analyses and travel costs, and should indicate all funding sources, including those requested from the Center. Applications for graduate fellowships should include: a) cover letter, b) CV or Resume, c) personal statement explaining how the fellowship will advance our knowledge in the areas of wetlands or restoration ecology, and d) letter of support from faculty advisor. Decisions will be made in April and funds will be available in May. Questions may be directed to Dr. Cathy Viverette at cbvivere@vcu.edu or Dr. Greg Garman at ggarman@vcu.edu. Chesapeake Bay Foundation Internship: CBF is collaborating with the Rice Rivers Center to offer a paid internship position ($6,000) in Summer, 2018. The Intern will assist the CBF Virginia Senior Scientist with projects related to the conservation and restoration of the Bay, including: review of current regulatory and voluntary nutrient reduction programs, evaluating approaches for achieving nutrient load reductions, assisting with GIS database creation and maintenance, assisting with oyster restoration efforts, and participating in educational boat trips. The successful candidate must be a current VCU student (graduate or undergraduate) with completed coursework in ecology and/or environmental studies. This internship is a part-time CBF position which will consist of 30 hours per week during the summer (start and end dates are negotiable). Applicants for the Internship should electronically submit a) cover letter, b) CV or resume, and c) letter of support from faculty advisor by 28 March to Dr. Joe Wood at jwood@cbf.org. Summer science writing and multimedia internships will soon be advertised at vaseagrant.org. These opportunities provide an undergraduate, recently graduated or graduate student with training in science communication, and will allow him or her to initiate new writing or video/photography projects, as they tell the story of how Virginia Sea Grant brokers science to community stakeholders. The internship offers students opportunities to develop interviewing, analysis, reporting, pitching, writing and shooting skills. Join Volunteers Around the World at VCU! This is an incredible opportunity to work alongside physicians to provide basic medical care to underserved communities abroad. 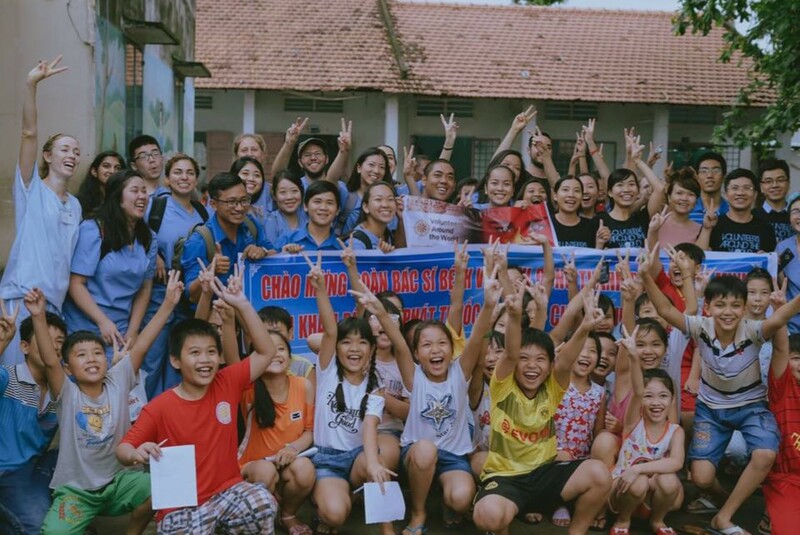 This summer, volunteers will take vitals, shadow doctors, distribute medications, learn about basic pharmacology, and prepare a public health lesson to teach to children in Cambodia. You will also have opportunities during free days to explore Cambodia and fully immerse yourself in the culture. This is a 2-week intensive trip valuable to those who want to get some hands on volunteering experience while also having fun exploring a new country. We are currently accepting applicants of all majors for our trip this summer to Cambodia! Contact us on our Facebook Page for an application: www.facebook.com/VAWatVCU and check out our national website: www.volunteersaroundtheworld.org. Applications for the 2018 Virginia Governor’s Fellows Program are due March 18th. The program is open to rising college seniors, graduating seniors, and students in professional or graduate programs. While placement in a specific office is not guaranteed, they work to place students in positions related to their interests in the Governor’s office or other agencies in the Executive Branch of the Virginia State government. Information about assignments can be found here: http://governor.virginia.gov/fellows/fellowship-opportunities/ Biology majors may be interested in several of these areas including Education, Agriculture and Forestry, and Health and Human Resources.